Describe a moment of beauty that you witnessed this year. Yesterday my mom remarked that she’s never thought of me as an only-child because I have so many “sisters”. She rattled off a list of names from my childhood, conjuring up memories of sleepovers, cheerleading, gymnastics, bike riding and long jogs together. My sisters and I have passionately laughed, cried, gossiped, fought, and loved one another for over 25 years. Vanessa even drove me to the hospital and photographed the birth of my first child. We roomed together all through college, and I was her matron of honor when she married her high-school sweetheart. She has been among my oldest and truest friends for as long as I can remember. Though I have many girlfriends I love to bits, there are three I shared particularly poignant moments of beauty with last summer. In their presence, I can completely relax, knowing I’ll never be judged or written off. Maureen and I were neighbors and walked to school together. She has a big family of origin, with four siblings, including a twin brother. When we were young, I enjoyed the bustle of her busy house, which was different from mine in many ways. On summer nights, she and I would often rock on her porch swing, dreaming of the future, the families we hoped to someday create. While I was visiting Ohio last summer, Vanessa and her family drove up from their home in North Carolina. Our daughters share the same name, and it was beautiful watching them play! 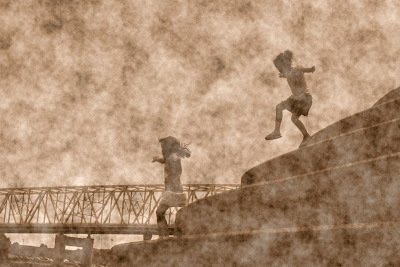 As they scaled steps on the riverfront, I watched nervously, hoping they wouldn’t fall. Then they began to jump, arms outstretched, confident and fully aware of their small bodies. I caught a glimmer of the energetic girls Vanessa and I once were. 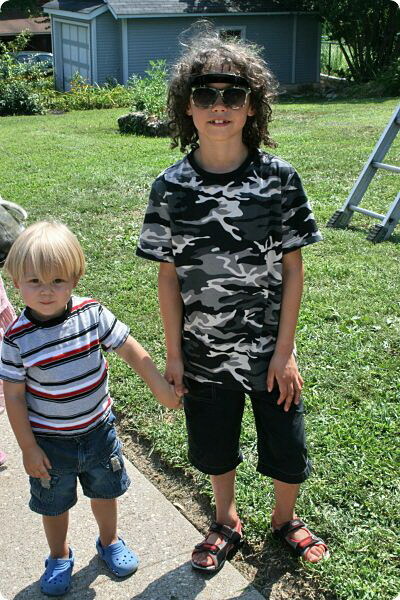 Our carefree children were full of trust and at ease with one another. One word came to mind: Grace. That same week Maureen and I brought our kids for ice-cream in our parents’ neighborhood. When we were teens, we’d walk the same path on hot nights. The trip to Dairy Queen became a ritual for us; it was special including our kids and sharing stories about our history. Both of us were touched watching our sons hold hands as we walked. Maureen’s boisterous three year old looked up to my “big boy”, and my son instinctively felt protective of him. They are both chatterboxes and it was hilarious listening to them! Their sense of wonder and curiosity, as they moved along together, made me smile. My kids and I were fortunate to also be invited to a very special 18th birthday celebration while we were in town. It was a family party, and I was pleased that my sister Jodie asked us to come. I remember helping to plan her baby shower when we were 18. It was a shock realizing her son is the same age we were back then! Jodie was the first to become a mother in my circle of friends, and I have always admired her strength and commitment. Her son has become a wonderful young man and is off to college now. I’m so proud of them for their achievements. Witnessing these moments of connection were the most beautiful gifts of 2011. What were yours? I’d like to close with a blessing from John O’Donohue’s book Beauty: The Invisible Embrace. May your soul discover time is presence. I am seeing high school friends and college roommates when I go home over the holidays. This post makes me so excited to give them all big huge hugs!! I want to hug this post like a teddy bear! And the photo of your sons holding hands is too precious for words. Thank you for this post. Our sisterhood is one of the biggest blessings of my life. What a beautiful description of love made visible in friendship - through the years and beyond the miles. The love expands and flows on, as witnessed in the instant bond of our two sons! Good friends and good times, what more can a person hope for? There are so many beautiful moments that come from just being with the people that know us the best. Thanks for sharing. This is lovely. How great that you have kept such important people in your lives and that you are sharing that gift with your kids. Thanks for stopping by, Jason. I think it's the sense of acceptance that makes those moments so special with the ones who know us best. It such a gift to just "be" in the presence of another.